The latest collection of new Holmes stories published by MX to help preserve the former home of Sir Arthur Conan Doyle. 2017 is the 130th anniversary of the publication of A Study in Scarlet, the first recorded adventure of Sherlock Holmes and Dr. John H. Watson. What an amazing journey it's been! In addition to the pitifully few sixty tales originally presented in The Canon, published between 1887 and 1927, there have been literally thousands of additional Holmes adventures in the form of books, short stories, radio and television episodes, movies, manuscripts, comics, and fan fiction. And yet, for those who are true friends and admirers of the Master Detective of Baker Street, where it is always 1895 (or a few decades on either side of that!) these stories are not enough. Give us more! In 2015, The MX Book of New Sherlock Holmes Stories burst upon the scene, featuring stories set within the correct time period, and written by many of today's leading Sherlockian authors from around the world. Those first three volumes were overwhelmingly received, and there were soon calls for additional collections. Since then, the popularity has only continued to grow. Two more volumes were released in 2016, and this the first of two planned for 2017 - with no end in sight! The thirty-five stories in this volume - now bringing the total number of narratives and participating authors in this series to well over one-hundred! - represent some of the finest new Holmesian storytelling to be found, and honor the man described by Watson as "the best and wisest . . . whom I have ever known." 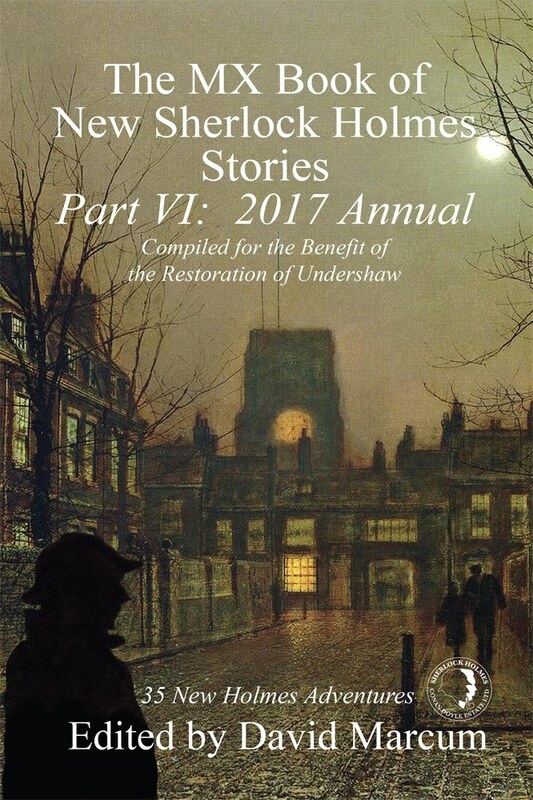 All royalties from this collection are being donated by the writers for the benefit of the preservation of Undershaw, one of the former homes of Sir Arthur Conan Doyle. Part VI: 2017 Annual features contributions by: Bob Byrne, Julie McKuras, Derrick Belanger, Robert Perret, Deanna Baran, G.C. Rosenquist, Hugh Ashton, David Timson, Shane Simmons, Stephen Wade, Mark Mower, David Friend, Nick Cardillo, Roger Riccard, S. Subramanian, Carl L. Heifetz, Geri Schear, S.F. Bennett, Jennifer Copping, Jim French, Carla Coupe, Narrelle Harris, Arthur Hall, Craig Janacek, Marcia Wilson, Tracy Revels, Molly Carr, Keith Hann, David Ruffle, David Marcum, Thomas A. Turley, Jan Edwards, C. Edward Davis, Tim Symonds, and Daniel D. Victor, with a poem by Bonnie MacBird, and forewords by David Marcum, Nicholas Utechin, Roger Johnson, Steve Emecz, and Melissa Farnham.